Your trusted logistical solution since 1929. Communication is essential allowing flexibility with immediate changes in our ever-changing distribution world. 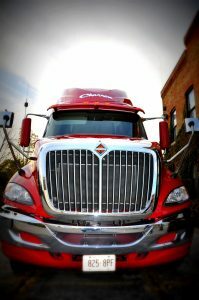 Charron Transport fleet is equipped with state-of-the-art mobile communication. Charron Transport’s main objective is to keep our fleet operating at the lowest level of breakdowns by utilizing tightened service schedules. Trained technicians service our tractors and trailers utilizing our on-site 5 bay facility. We work by the highest standards of delivery accuracy and safety for drivers and cargo. All trucks equipped with GPS tracking.